Horatio Luro-El Gran Senor. Has there ever existed in the world of Thoroughbred racing a human being who combined as much exquisite horsemanship with as much glamour? I do not think so. He was a tall, handsome boulevardier from a distinguished Argentine family, a charming polo-playing and lady's man, who came to the states before World War II, teamed up with Charlie Whittingham in California and they hustled their way into the top of the Big Time in the racing world. Again, with a combination of superb horsemanship, chutzpah and personality. To meet Horatio was to never forget him. He looked like "somebody." He stood six foot-three, had a pencil-thin mustache, quite handsome, with a dashing, elegant, but devilish, look about him. He dressed in the finest tradition of Saville Row. Even in the early days, when he was flat broke, he was somehow able to wine and dine and operate with the cream of high society. He knew how to buy a good horse, and he surely knew how to train one. He had a fling with the gorgeous actress, Lana Turner (quite an accomplishment), and later was married for 37 years to a truly impressive lady. No horse trainer ever had a deeper impact on the Thoroughbred breed. He brought to this country the splendid Princequillo and developed him into one of the greatest stayers of his time. 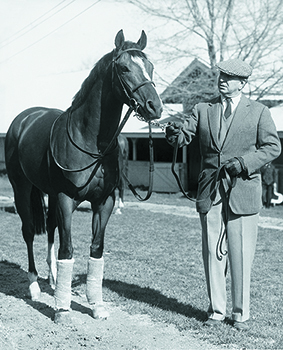 At stud, with Bull Hancock at Claiborne, Princequillo became the dominant influence of stamina in the sport. Later Luro took a blocky, little bay horse that did not meet his reserve when E.P. 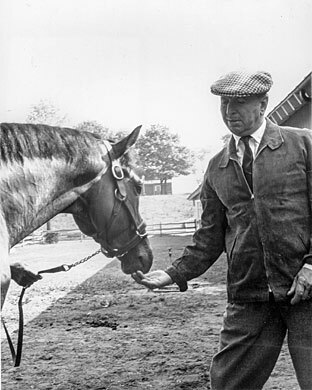 Taylor sold him as a yearling and made him into a magnificent race horse and arguably the greatest sire that ever lived. His name was Northern Dancer. The Senor won the Derby with him; he also won it with Decidedly. Space would literally not permit a list of other distinguished stakes winners trained by Luro. 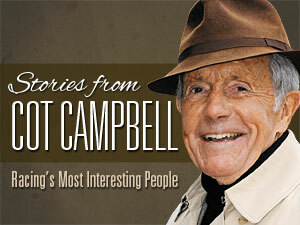 Like most great characters with panache and charm, he was not always easy. He was a prima donna, had a temper, and since he never quite mastered all the nuances of the English language, he could stumble verbally into awkward situations. That's when his wife Frances, who was sophisticated and urbane, and oozed charm from every pore, could help out immeasurably when some diplomacy was needed. However, his own legendary brand was usually quite adequate. An example of that was tested when he ran a filly at Atlantic City. She was winning quite easily, but inexplicably, when approaching the wire, she careened over the rail, ran into the lake and panicked. Sadly, she drowned before anyone could reach her. Later, Horatio lamented, "How am I going to call the owner and tell him that the filly was winning the race but then drowned?" Much earlier, he had encountered another awkward situation back home in Argentina. Never in my rather long life have I encountered-or seen-a human being that had actually engaged in a duel. Horatio Luro did! In a dispute over a polo pony board bill, Horatio struck the landlord, an Argentine nobleman. The infuriated injured party "demanded satisfaction." Seconds were chosen, weapons selected. Luro was given the choice, and because his adversary had just returned from a hunting trip, swords rather than guns seemed the smarter option. Horatio took a quick course in fencing, which paid off significantly. He was advised that because of his six foot-three height, he should simply keep his weapon extended into the face of the other shorter man. This he did, and his raging opponent ran into the sword, nicked his arm, blood was drawn, and the duel had been satisfied. Perhaps Thoroughbred racing would have been the poorer had revolvers been the choice. A well-documented example of his temper came at the expense of a jockey named Eddie Belmonte. Subbing for Luro's regular rider in a race at Saratoga, he was told to take the horse back and make one big run. Instead Eddie broke and gunned the horse to the lead and hustled him to stay there. He ran out of gas. Luro had placed a rather sizeable bet on the horse, and when the rider dismounted the Senor tried with considerable enthusiasm to choke him-in front of the grandstand. He was suspended for 30 days for this rather unpleasant behavior. He was not reluctant to take suggestions from assistants and exercise riders. And he really hit it off with jockeys remarkably well. He liked Bill Hartack, respected his opinion, and adopted a number of his suggestions. Hartack, a wonderful rider, had the disposition of a viper, but there was mutual respect and harmony between him and the Senor. The well-used expression of today, having to do with asking too much of a horse, was born prior to the running of the 1960 Blue Grass Stakes. Horatio told Bill, "This is not our main objective. Do not squeeze the lemon dry." Hartack was a man who could squeeze the hell out of the lemon, but he did not on Victoria Park that day. Still he deserted him in the Derby a couple of weeks later, and energetically rode Venetian Way to victory. Horatio's aforementioned wife, Frances, owned a large farm near Atlanta in Cartersville, Ga. Luro converted this into a training center, and Dogwood was one of its clients in the late sixties and early seventies before we built our own farm. Frances was very prominent in Atlanta (and most other) social circles. She had a daughter, Cary, who was named "debutante of the year," and subsequently was married a fair amount of times. Still another nuptial was being planned at the farm for Horatio's much-married step-daughter, and it was to be a big social event, involving a rehearsal, and a gala rehearsal dinner. Horatio was, of course, summoned back from Belmont Park for the event, and he groused, "I do not see the need for rehearsal. She has done this many times, and must be familiar with the procedure by now." Frances and Horatio were at the very top of the social ladder in the glamour days of racing. Being new to the game in the early seventies, my wife Anne and I were flattered when they took note of us in some insignificant way. This led to an embarrassing situation one year in Florida. Frances was the chairwoman of the elegant Flamingo Ball, which took place at Hialeah. She, of course, was hustling participation, and zeroed in on Anne and me. Now Frances was wonderful and gracious, but she did have a little con in her. And she did mean to fill up the tables at the Ball. She cooed to Anne and me, "Horatio and I are so hoping you all will join us at the Ball!" We thought this meant, "Come sit with us at our table." What a nice social breakthrough for a young couple! What she really meant was, "Buy two tickets to the Ball, and use them." We arrived at the Ball, and breezily informed the person at the door that we were guests of the Luros'. Oddly we were not on the list. Obviously an omission. So, we paid for two, went in, and excitedly sought out the Luro table. It was chock full of heavy-hitters, of course. Frances waved cordially, but vaguely. We got the picture, and found a couple of spots at a table-near the kitchen. Horatio and Frances were a great team. 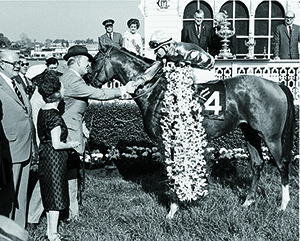 Just as Penny Chenery contributed to the overall image of Secretariat, so did Frances Luro contribute enormously to the dashing, debonair persona of the Senor. He trained well into his eighties, then turned over the stock to his beloved step-grandson, Billy Wright, who still operates Old Mill Farm in Cartersville, Ga.
We will not see the likes of Horatio Luro again.